We provide centralized power that is safe, reliable, economical, and sustainable. Malaysia has an abundance of natural resources that can be used to generate electricity, cooling and heat. The current grid system generates electricity at a location far away from the customers, resulting in up to 60% transmission losses. Malaysia’s electricity generation is hugely dependant on imported coal and fuel, the price of which is prone to volatile fluctuations. Historically, the electricity price in Malaysia has increased from RM 0.288 per kWh before 2011 to RM 0.3650 per kWh after 2014 for commercial C1 tariff users, a 26.7% increment in 3 years. 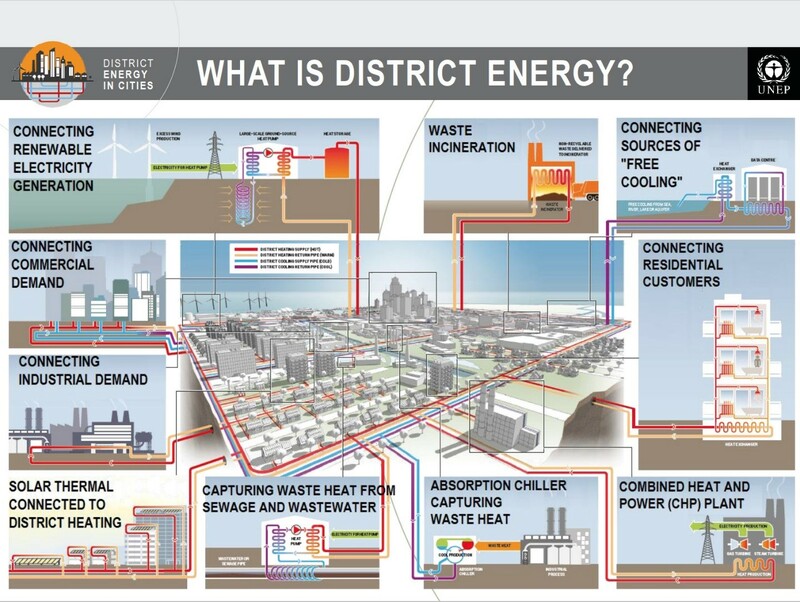 DES combines electricity, cooling and heat supply by utilising local resources that can be generated into energy such as biomass, municipal solid waste, biogas, solar, wind, hydro and hydrogen. The integration of renewable energy technologies, storage and control system designed based on the available resources, cost, generation profile and user demand profile will ensure the resources are fully optimised. Building owners, developers (housing/industrial/town), farm owners and industrial owners have huge potential in making use of the available natural resources and surplus heat to generate electricity, cooling and heat for their own use by selling the surplus to the primary grid. This system is a great solution for communities in rural areas that can’t be connected by the main power grid. Contrary to the conventional one source system such as PV system alone, our approach is to analyse the potential natural resources that can be used to generate electricity/cooling/heat, then design an integrated system to achieve the highest efficiency at the best cost price and lowest carbon emission. For example, a palm oil factory can benefit from its own micro grid using palm waste to power up anaerobic digester/gasifier integrated with solar panels and combined cooling and power engine to generate electricity and cooling, aided with control system and electrical storage. The waste from anaerobic digester/gasifier can be processed into fertiliser. Our aim is to minimise waste and optimise useful products. Surplus electricity from the onsite microgrid generator can be sold to the main grid using Feed in Tariff (FiT) programme. The FiT is Malaysia’s new mechanism under the Renewable Energy Policy and Action Plan to catalyse generation of RE, up to 30 MW in size. This mechanism allows electricity produced from indigenous renewable energy resources to be sold to power utilities at a fixed premium price for a specific duration. For more information on Feed-in Tariff please visit www.seda.gov.my. The basic concept of feed-in tariff is that the Distribution Licensee pays the Feed-in Approval Holder a premium tariff for clean energy that is generated. This allows owners to sell their clean energy to the distribution licensee for a fixed number of years; the duration is dictated by the type of renewable energy used for power generation. The incentive provides a fixed payment from the electricity supplier for every kilowatt hour (kWh) of electricity generated and a guaranteed minimum payment for every kWh exported to the grid. The electricity tariffs from renewable energies has a higher selling price compared to conventional fossil fuel electricity. System’s design: resources analysis, system design, sizing, control system, storage, costing, energy simulation and payback period.